My research interests root in matrices, fundamental mathematical objects that are not numbers, but tables of numbers and also mappings between two universes. What I study are as deep as the theory and the computation, as wide as numerical analysis, scientific computing, and parallel processing, and as applied as statistics and machine learning. My work is heavily convoluted with data, because numerical and scalable computations play a crucial role there. A line of my efforts focuses on linear-complexity computations of large dense matrices defined by kernels. In practice, they entail the most common structure for matrices that are both large and dense. Linear complexity is the right, if not the only, way to match the theoretical appeals of matrix methods with the Moore's law progress of computer technology and the surge of data and information. Graphs are siblings of matrices, encoding relational interactions within a complex system. Another line of my efforts focuses on graph-based deep learning, including generative modeling, structure learning, stochastic optimization, and further resurgent subjects propelled by the empirical success of deep learning. The gap between theory and practice of deep neural networks remains, not to mention the long journey toward artificial general intelligence, but innovations enabled by exploding computing power are never underestimated. Would quantum computing be the next? Ph.D. 2010, Computer Science, University of Minnesota. B.S. 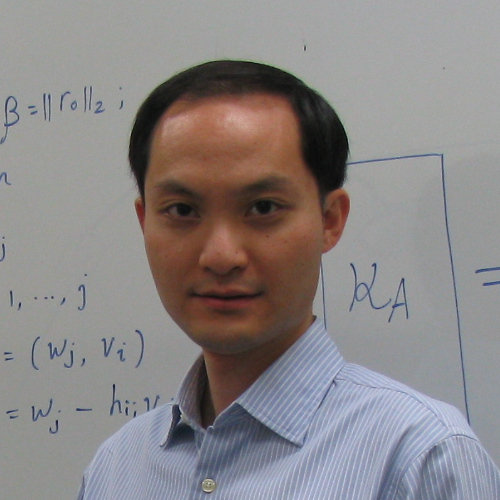 2004, Mathematics, Chu Kochen Honors College, Zhejiang University. Mathematics and Computer Science Division, Argonne National Laboratory. ©2014 Jie Chen. All rights reserved.